The three types of median barrier used by MoDOT include concrete barrier, Type B guardrail, and guard cable. This article primarily deals with concrete barrier. There are many aspects to be considered when inspecting construction quality and this article also provides construction inspection guidelines, material inspection guidelines as well as Maintenance planning guidelines for concrete traffic barriers. Concrete barrier and Type B guardrail are placed on a flush median. Warrants for median barrier are used to determine the locations for which these two types of barrier are to be provided. Concrete barrier is generally limited to the high volume roadways with narrow width medians. When concrete barrier is used, Type C (and Type D, as required) is the preferred configuration for new construction. Type A (and Type B, as required) is only to be used for new construction projects in a retrofit condition or to “tie in” to existing Type A concrete barrier, which exists on adjoining sections of roadway. An approved crash cushion or sloped end crashworthy end terminal is the required end treatment for concrete barriers. 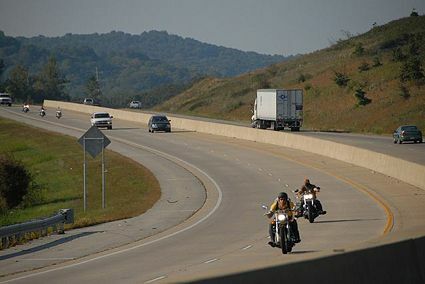 A barrier height transition is not to be used in locations where the posted speed limit is greater than 35 mph. Where height transitions are used, they are to be located as far as practicable from the traffic lanes, and if possible, the lead end flared outside the clear zone. Concrete barrier details and barrier height transitions are shown in Standard Plan 617.10. The distance between the left hand edge of the lane next to the median and the face of the concrete median barrier is not to be more than 15 ft. (4.5 m). Permanent barrier wall and bridge barrier wall delineation shall be in accordance with Sec 617.30 of the Standard Specifications. The design of barrier wall delineators shall be in acordance with Standard Plan 617.10 and Sec 1065. Medians wider than 36 ft. are sufficiently wide to satisfy clear zone requirements, thus making the provision of median barrier (refer to warrants for median barrier) optional. 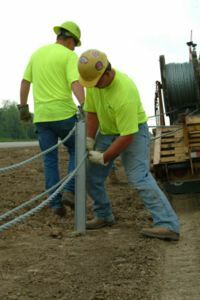 While the provision of a concrete barrier or Type B guardrail may not be required at these locations, a three-strand guard cable may be desirable. Although the cable system is relatively inexpensive to install, when compared with a concrete barrier or Type B guardrail system, and performs well when hit, it must be repaired after each hit to maintain its effectiveness. Especially for low-tension guard cable, this repair must be done as quickly as possible after a hit to ensure the effectiveness of the barrier. Consequently, its use in areas where it is likely to be frequently hit is not recommended. In these situations other types of median barrier are to be considered. Guardrail or concrete barrier blunt ends located on either side of a two-way roadway or on the guardrail approach end of dual lane facilities must be replaced with an approved crashworthy end terminal even if the project covers only rehabilitation of the roadway in one direction. Articles in "617 Traffic Barrier"
This page was last modified on 28 September 2018, at 09:23.